Louis Kaufman was an American violinist born on May 10, 1905 (Heifetz was four years old.) 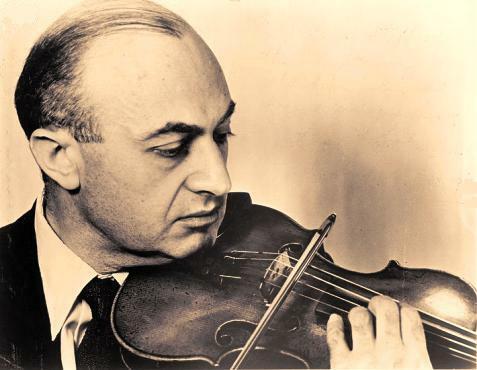 He was probably the most recorded violinist of all time, though Heifetz and Ricci can claim the same thing. He played for the soundtracks on as many as 500 movies and also made 125 recordings on 30 different labels. It has been said that his tone was similar to Heifetz’. Kaufman began to study at Juilliard with Franz Kneisel at age 13. His solo debut took place at Town Hall in 1928 and was very successful. He played viola in the Musical Art Quartet for seven years (1926-1933.) Among his chamber music colleagues were Jascha Heifetz, Pablo Casals, Mischa Elman, Fritz Kreisler, and Efrem Zimbalist. His 1947 recording of Vivaldi’s Four Seasons brought Vivaldi’s music to the general public’s attention, though violinist Olga Rudge (Ezra Pound’s mistress) is given credit for rediscovering Vivaldi in Italy, just as Mendelssohn is credited with rediscovering Bach’s music. (Alfredo Campoli is credited with the first recording of the Four Seasons - in 1939 from a radio broadcast - and Bernardo Molinari with the second - in 1942.) A YouTube post of Kaufman playing the third concerto of Camille Saint Saens is available here. If Heifetz had recorded the Saint Saens concerto, it might have sounded something like that. Kaufman also championed the works of many contemporary composers, Francis Poulenc and Darius Milhaud among them. Even while he worked for the movie studios, he concertized around the world. Among the hundreds of movie soundtracks his violin is heard in are Casablanca, The Grapes of Wrath, Cleopatra, and Gone With The Wind. Kaufman was also the first to record Samuel Barber’s violin concerto. His autobiography, published in 2003, is titled A Fiddler’s Tale. Kaufman died on February 9, 1994, at age 88. Kaufman played on a Stradivarius violin (among others) but I could not determine the year - 1727 perhaps.